Less leakage = more comfort. Sealing cracks and gaps around window openings is an important weatherization upgrade that can prevent frigid outdoor air from getting into the house during the winter. The word “weatherize” was first used around 1945, to describe the many different procedures and treatments used to protect a building from adverse weather. Today that definition still stands, but we know a great deal more about how houses perform in all kinds of weather conditions. We also have an impressive arsenal of weatherizing products. With today's technology, there’s no reason to put up with uncomfortable rooms and high utility expenses in your home. That's why Larson Home Services is here to help! Our weatherization services are designed to address energy weaknesses - improving the indoor air quality and overall home comfort. We offer weatherization services in Janesville, Sun Prairie, Middleton and nearby. Call us today at 1-844-651-0955 or click below to schedule a free estimate! This structural assembly typically contains wood framing (studs, plates, rafters and sheathing) as well as insulation, water-resistant membranes and finished surfaces (roofing, siding, wallboard). Windows and exterior doors are also included in the building envelope. Free estimates for all recommended weatherization work. Weatherstrip windows and exterior doors. Air seal around interior trim. Seal & insulate the basement rim joists. Replacement windows & exterior doors. Rooms become too hot or too cold at certain times of the year. You can feel cold winter drafts in different parts of the house. Worn or missing weatherstripping around an exterior door. High utility bills for heating and cooling. Recessed ("can") lights in the ceiling directly below the attic. Inadequate attic insulation (less than 12 in. of fiberglass or cellulose). Research by the U.S. Dept. of Energy tells us that many households use twice as much energy (including electricity, natural gas, propane and fuel oil) as they should. Much of this wasted energy is due to leaky and poorly insulated building envelopes that force HVAC systems to consume excess electricity and/or fuel. You can detect these building envelope problems by looking for any of the 6 symptoms listed to the right. Weatherization problems occur because builders aren’t required to seal energy-wasting air leaks or install more than minimum levels of home insulation during construction. But this doesn’t mean you have to put up with uncomfortable rooms and high utility bills. 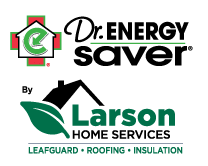 Larson Home Services' highly trained weatherization installers and technicians can transform an uncomfortable, energy-wasting house into a comfortable, energy-efficient “green” home. Using some of the best performing materials available (caulk, spray foam, different types of insulation, door sweeps, weatherstripping, gaskets and more), we will complete all the weatherization upgrades you select. Wouldn’t you like your house to be more comfortable and less expensive to live in and own? Get started today by calling 1-844-651-0955 for a free weatherization evaluation and free estimate. We proudly serve in Sun Prairie, Middleton, Janesville, Stoughton, Waunakee, Mc Farland, Verona, DeForest, Mount Horeb and throughout the surrounding areas.